It’s one of the tallest freestanding buildings man has ever constructed. There’s a restaurant at the top. It even caters for vegetarians. So that’s where the Doctor and Mel are going. Only trouble is, they’ve arrived fifty years too late – the tower, most recently the headquarters of the terrifying aliens The Eminence, is scheduled for destruction. And now, instead of an easy meal, the Doctor finds himself battling inside his own mind with a presence he thought he had rid himself of several regenerations ago. And that’s just for starters…It’s an odd one, this. It feels like we’ve dropped in halfway through an encounter. In the past we’ve re-encountered the Rani, Magnus Greel, the Mara, and sometimes not even in chronological order. The same is happening here, but this time we have never met the Eminence before. Yet the Doctor has – he gets defensively offensive on their case, much to Mel’s surprise, acting most unlike himself. The listener is dumped into this battle for the minds of humanity with very little backdrop. Again, with the likes of the Mara, Greel, etc, we’ve always had a sort of grounding from the TV series. Big Finish are being perhaps a little too clever in giving the Sixth Doctor an “old enemy” that we haven’t even met in a previous incarnation yet. (For the record, it’s Tom Baker and Leela who will have to deal with the Eminence) As we get through to the more recent adventures of the Eighth Doctor, we’ll have to deal with the Eminence a lot more, which on this evidence I’m having mixed feelings about, although I could quite happily listen to Paul McGann read the letters page of the Daily Fail as his voice could polish even that cow-turd. So is the Eminence any good? Or is it another Viyran menace? See, the thing with the Viyrans was that they were pretty much omnipotent. They were almost too large for any one story to contain them. They had plenty of menace while they were offstage, but once they actually turned up in the flesh, they ended up being a bit… anti-climactic. The Eminence, for all they’re hyped up in the first episode of this story to be one of the universe’s ultimate forces, with the Infinite Warriors and the Breath of Forever, and the Eyes of Laura Mars (no, I made that bit up), end up being a cloud of gas and a voice inside the Doctor’s own head. Sort of levelled-up Rutans. If your villain is capable of menacing the entire galaxy, then your story has to be well over the top too. 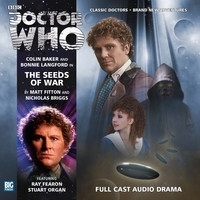 Seeds of War certainly tries, with the massive tower that the Tardis materialises inside in the first episode, a colony world starved by war, and a three-month voyage to ancient, abandoned homeworld Earth, but perhaps because the emphasis is on the Eminence being inside the Doctor’s head, the backdrops struggle to make much of an impact (well, aside from the tower collapsing. That definitely makes an impact…). The characters? Given that this is a story designed to “introduce” the Eminence to us, it’s no surprise to find that the characters aren’t as fully rounded as they might otherwise have been. Ony Uhiara comes off best as Sisrella, but the others are constricted by their archetypes to a greater or lesser extent. There’s a tea-obsessed scientist, an honorable soldier, an inflammatory rebel… and given, again, that this story has to introduce the Eminence, the biggest threat to the universe since Michael Grade, they must all be expendable. It’s a good job the Doctor isn’t really feeling himself, otherwise he might be a bit horrified by that. Even poor Mel gets to suffer – first a broken arm, then hypersleep, and then a scene with a robot named “Carrot Juice”. You can probably tell that I’m a bit underwhelmed. I would have liked more… and less at the same time. Draw the plot back in, lay off the galaxy-spanning threats, and give us a dilemma or peril we can really care about, along with characters who aren’t overwhelmed by the size of the villains.